Just imagine the convenience! Think about it...a mini-store brought to your hospital/ facility, loaded with supervalues, awesome selection and the quality you've come to expect. Just call and we'll take care of the rest! It's that simple. You'll just love us! Keep losing your name tag? Just think how sharp you'll look in your new, custom embroidered uniform! "So long, name tag!" We offer convenient billing options to meet the needs of your business. We'll even make sure your favorites are in stock and ready to go! Come on over or give us a call. Can we come over? We’d love to show you our latest scrubs. We’ll even help fit your crew and deliver it too! 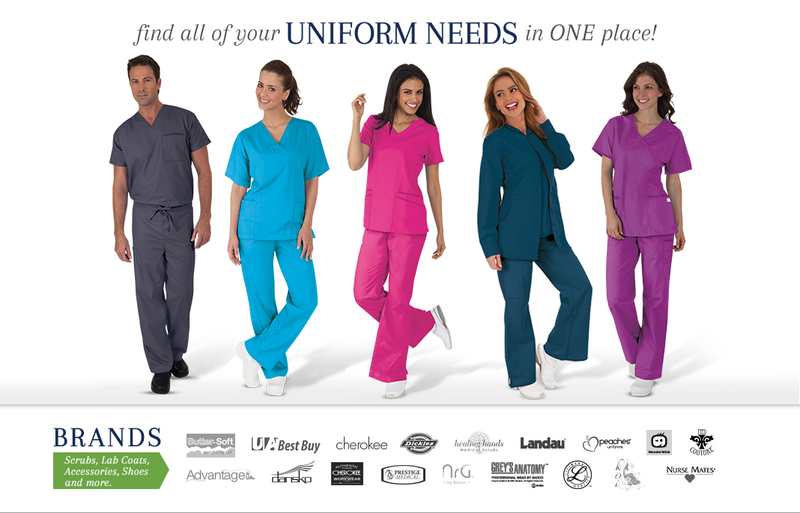 Need uniforms? Short on cash? Don't worry, with this program, you want it...you got it! Your purchases can be spread out over several pay checks! If your employer doesn't offer this yet, just have them give us a call. It's so easy! Call your nearest retail location for more details! Can't find what you're looking for? We've got connections! If it's on this planet, we'll get it! No time to shop? Live in Timbuktu? Don’t worry, we’ll ship it to you. Just call a location nearest to you. Get ready for an unforgettable fashion show at your location! Take a front row seat and experience the latest styles and prints that will be sure to make your hospital a smash hit every day! Just give us a ring.